Before I Wake is the 6th book in the Soul Screamers series and I'm going to assume that anyone who is reading this review has already read the previous books. If you're not up to date with the series then look away now because this review will contain spoilers for If I Die. I'm a massive Rachel Vincent fan, I love her adult books but I also love this series - in fact it is one of my favourite YA series so I couldn't wait to read this book! For those who haven't started reading these books yet I just have to ask you why the heck not? Go out and grab a copy of My Soul to Take immediately - I promise you won't regret it! This instalment to the series sees Kaylee trying to come to terms with her death and her subsequent afterlife as an extractor. She is finding it hard to remain visible to her friends and family and often starts to disappear if she loses her concentration - not something that makes it easy to avoid attention at school. She also has to learn how to use the new abilities she has and discover how they will help her with her new role in the reclamation department. From her first assignment she realises that nothing is going to be quite what she expected and she is going to have to face an old foe who has developed surprising and worrying new skills. Luckily she has the support of Tod and her family but things are going to get worse before they can get better. 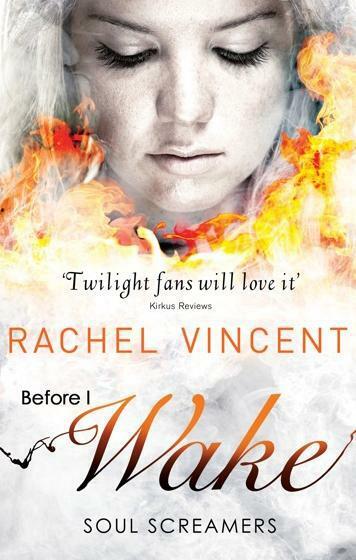 As the second to last book in the series you can expect some dramatic events in Before I Wake. Things that will shock and horrify you but also moments that will squeeze your heart and make you sigh happily. Kaylee has been through so much in the last few months but she has grown so much stronger because of it. No matter how hard her life has been she has always tried to stand up for those who couldn't stand up for themselves. She has always tried to protect the innocent even if it comes at a high cost to herself so fans won't be surprised to see that selflessness continue. She has to face some truly horrible events in this book though, things that are going to have lasting consequences on her and those around her. I absolutely love the developments in Kaylee and Tod's relationship, they are so sweet together and I couldn't be more happy with the way things have turned out. I was firmly on team Nash for the earlier books but I really think that with everything they have been through there could have been no happy ever after for them. It was nice to see them start to regain a bit of their previous friendship though and I hope that Nash continues to sort himself out and get over his Frost addiction. Anyway, as far as Kaylee's love life goes I'm now definitely a member of team Tod! I really liked the addition of Luca to the story, we were introduced to his character in the Never to Sleep novella and I had a feeling we'd be seeing more of him. I'm looking forward to finding out more about his abilities. We also get to see Sophie from a different light in this book, I'm still not her biggest fan but it seems like she has finally started to grow up a bit - about time really! I don't want to talk about any more of the plot so I'm just going to say that this is another great instalment to a fantastic series. As much as I'm dying to read With All My Soul I'm equally sad that this series is coming to a close. I'm going to miss Kaylee and gang after it ends! I'm sure that this is a series I will be re-reading in the future though and that has to be the highest praise I can give it because I hardly ever re-read books anymore.